Selling your property doesn’t have to be full of hassle and stress. You can do it with ease by following these simple steps for success. 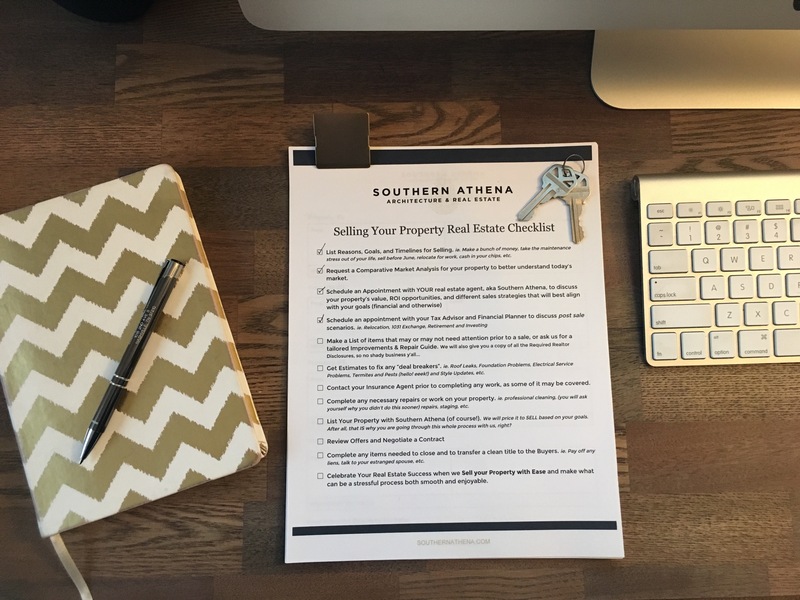 Get started today – Download our FREE Selling Your Real Estate Checklist! Just enter your name and email below, then click the link in the pink box! If you want to get started in the process without any of the typical, high pressure, list NOW “Realtor Sales Pitches”, then go ahead and start down the list before calling us. We are good at those sales pitches too, if you just need a nudge off of the fence. 😉 Either way, contact us when you are ready. We will be here as a resource and are excited to help make the process more enjoyable and easy. Why are you considering Selling right now? Did you hear the market is hot from your neighbor? Are you looking to move or relocate for a job? Maybe you are tired of all the maintenance and fees associated with your current home and want to take the stress out of your life with something a little newer or flexible. Is there a deadline you have to meet, such as school starting or relocating for a job? The reasons for selling are too numerous to count here, but they are very important in determining the best strategy for HOW you sell. Listing out your reasons, your goals, and timelines will help you understand the full picture of your decision as well as allow us to provide better service for your individual needs. Understanding today’s market is paramount in positioning your home for Sale. One of the typical ways a Realtor begins to develop a suggested sales price range for your home is based on comparing current market data with your specific home and then making calculated adjustments. The lingo here is a CMA – “Comparative Market Analysis”. It is just how it sounds – a list of comparable properties in the market that can be used to analyse current market data. Often the CMA lists average and median price per square foot, Asking vs Actual sales prices, and other data such as days on market, number of bedrooms, etc. Oh dear, the average days on market doesn’t match up with your timelines goals from step 1? We can help provide solutions to make the Selling process a success, by always allowing a strong foundation of data to drive those decisions and tactics. Schedule an Appointment with YOUR Real Estate Agent. First, if you don’t have a great real estate agent working exclusively on your behalf throughout the entire process, you may lose out on a ton of money and the possibility of having the most successful transaction possible. You should schedule your appointment with us as soon as you are able. We will help you uncover your property’s market value, ROI opportunities, and different sales strategies that will best align with your goals (financial and otherwise). For instance, your agent should review the CMA reports with you to better help fill in any “first hand” knowledge gaps the numbers might not reveal. For instance: Is your HVAC older than average but all other similar priced homes have newer units? Or is your master bath just the bees-knees compared to typical master baths in the area. These specific home factors then start to further impact the final listing price range we would advise to realistically sell your home. Your goals, timing, and financial needs will also all have an impact on your listing. Say you need to sell fast; then you may not have the luxury of starting at the top of our listing recommendation because you need more people looking today. Say you have to meet a certain financial number to walk away but are not in any rush; then adding high quality photos and developing a more intensive marketing plan with your Realtor will ensure that your higher price point becomes a reality. We talk about it all at our listings appointments. The more on the table to discuss, the better we can serve your specific needs. This one may seem like it is coming out of left field at first, but think about it. Tax and Financial implications can cost you big time. Your financial picture often changes drastically after the sale of your home, which is why it is so important to discuss repercussions prior to listing. Your tax advisor or financial planner may bring up implications for your specific scenario that we might not have known where pertinent. Though we try to cover the basics, such as Relocation, 1031 Exchange, Retirement and Investing, we always suggest you contact industry experts to review your full tax and financial picture. This way everyone can ensure that you are covering all of your bases properly. Having a list of items that may or may not need attention prior to a sale will help mitigate any issues a Buyer could bring up as leverage to negotiate a high price reduction that is not in your favor. If you know something needs maintenance that is well over due, then preemptive knowledge of this can give you an advantage. Scheduling your own home inspector can possibly save you thousands if you have the means to do some of the handy work prior to listing. If cash is tight, offering a Home Warranty can also protect you from Buyer’s asking for significant price reductions. It is typical for buyers to ask for price reductions even for little nit picky stuff, so knowing what you are up against will always give us the upper hand heading it off at the beginning of negotiations. After you come up with your list, ask us for a tailored Improvements & Repair Guide specific to your home. The items we suggest taking care of prior to listing will have the highest impact and pay off to benefit you as the Seller. *Yes, certain items like painting, or hiring a professional carpet cleaner can have larger payouts than you would ever believe. In order to list, all Sellers have to fill out a Property Condition Disclosure Form and all Required Realtor Disclosures with the basics on their property, so no shady business y’all… When it comes to Repairs and Improvements, honesty is the best policy. Age of Major Systems – HVAC, water heater, etc. A general rule of thumb, if there is a professional service out there dedicated to the specific system or problem, it could potentially be a deal breaker. Call a professional, get a quote, its not too hard. Do this prior to completing any work, as some of it may be covered under your existing insurance, like roof repairs for recent hail damage. Newer policies also sometimes require homeowners to have items that may not have been required when you purchased – ie. Railings at your front steps, or GFCI outlets in wet areas. Asking for information on any new standards could protect you from unexpected requests from the Buyer. Also, it is good to ask your insurance agent about any repercussions of Selling. Do you have a bundled policy with your car insurance that gives you a discount that will go away after you sell? Can they tell you how much you will be receiving back on your policy when you close? This is all just great information to have and an informed Seller makes better decisions with less stress. If you have decided to Sell “As-Is”, skip this step. If not, doing some of the work suggested in the previous steps, even if not all of them, can have a tremendous impact on how quickly we can get your house on the market AND how quickly it will sell. Professional cleaning is almost always a good idea. You will ask yourself why you didn’t do this sooner. Specific repairs discussed with your agent may also be highly suggested. Decluttering, staging, etc. should always be done prior to listing so that your home is ready for the slew of buyers we are about to bring into your space. Just be wary of trying to tackle large updates on your own. Often they won’t pay out and you will be even more exhausted from the process, just to jump right into another energy intensive listing situation. There is no need for all of that. We want this to be enjoyable, not time, energy or financially draining. We suggest doing the repairs or updates within your means and budget. Simply adding new hardware or new light fixtures can make a huge difference in how your home shows and sells. We will price your home to SELL based on your goals. After all, that IS why you are still reading this long post and going through this whole process with us, right? We take care in the listing of all of our Southern Athena properties to take advantage of good ole’ American Capitalism! We plan everything out from the timing it goes live, to the specific marketing initiatives used to target your most competitive buyers, strategically plan open houses, and of course always recommend professional photography. We stand by our methods, experience, and track record for getting your home sold at the best price possible. If you want to list at a higher price point than the market allows, even though we would love that fat check, if we don’t think it is possible, we won’t waste your time or ours. After all, our whole goal is to make you the most money possible and to do so, we believe in pretty straightforward economic principles like supply and demand. It feels great to make people money with real estate, and happy dances from all parties usually ensue. Our service starts prior, but really takes on a whole new life when you list with us. 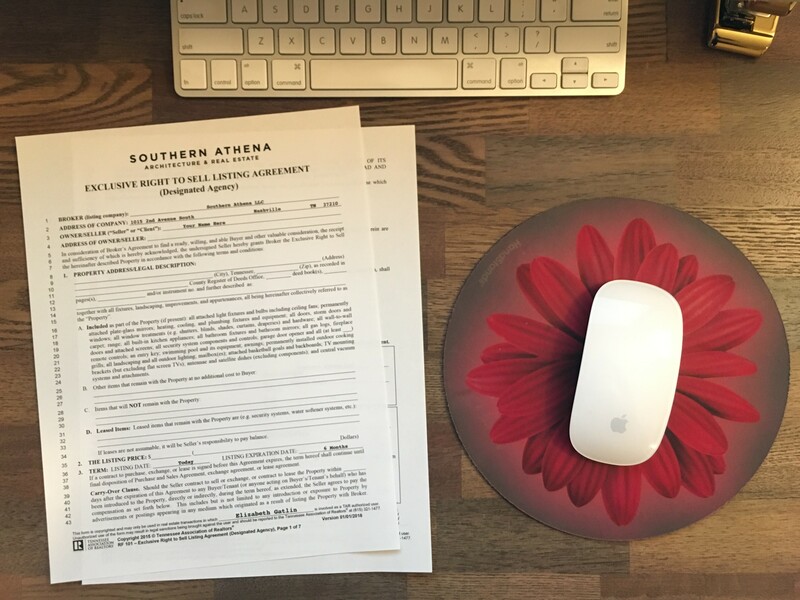 You will love the Southern Athena process, which includes digital signatures and paperless documents. Did you know that your first offer is usually the best? Time has a funny way of slowly negatively impacting your listing. The longer it sits, the less value it holds. The second offer comes in later in time than the first, and often reflects the change in price based on time. We receive offers and review each with you. In some cases, we will suggest a sales price that seems counter intuitive at first, but that we hope will encourage more competition through multiple offers. Sometimes a frenzy to scoop up a deal can pay out more than one interested buyer. Comparing and contrasting offers in this instance can ensure you really do get the most advantageous contract. There are a lot of items that go into a contract, so we review all of their implications with you. Often some back and forth will be required to get a final contract that works for all parties. This is where having an experienced Southern Athena agent comes in handy. Not only are all of our agents versed in basic negotiation tactics, but Liz teaches some of the higher stakes concepts that run rampant in the commercial real estate world. The bigger the stakes, the better negotiator you should have on your side. After the Buyer’s due diligence, you may be asked to complete additional items or repairs on your home. We will help you negotiate these items within their allotted contract time limits. Did you know that many agents don’t abide by contract deadlines and that it can be used to your advantage? So true. We take care of capitalizing on all opportunities that come about while you are under contract. The next item though might not be as obvious – being able to provide clean title to your property. This is more common in Condo’s, town homes, or PUDs, where an HOA is involved, but sometimes, there are items hanging out there that need to be addressed. Specifically, paying off any liens for work or issues relating to back taxes. Getting proper power of attorney from your estranged spouse or signatures from other relatives. These things all need to be taken care of prior to your close date, otherwise you may find you can’t actually sell your property, and damages are owed. Giving renters their allotted notices is also a biggie that we have seen delay closing. And of course, last but not least, you need to start packing and moving out before the Buyer’s final walk through date. Everything needs to be OUT and the place needs to look great if you want a nice clean and easy closing. Celebrate Your Real Estate Success! Alright! This last box better be the best to check off! You know it is our favorite. We did it, we sold your property! Now we celebrate. No skipping this step allowed. Everyone deserves a moment to breathe and rejoice. Take it, feel great about it, and celebrate your success with class and style. A night out in Nashville perhaps? A pampering massage for your sore moving muscles? Be sure to tell us how you like to celebrate and we will bring our game faces and champagne. We are so thankful you have allowed us live our life’s passion – “Building a Beautiful South” by helping serve you throughout this real estate process.